When Georgia Hunter was 15 years old, she discovered that her grandfather and his family were Holocaust survivors. Years later, she embarked on a journey of intensive research that resulted in the New York Times best seller We Were the Lucky Ones, a gripping epic of endurance against all odds. Hunter will present an illustrated backstory of her decade-long quest to unearth and record her family’s story, revealing the extraordinary discoveries she made along the way about her family, her own identity, and the resilience of the human spirit. 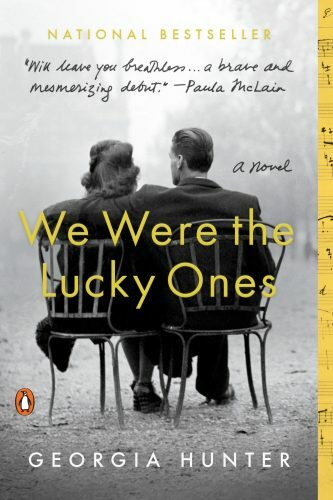 Book signing to follow – copies of We Were the Lucky Ones will be available for purchase at Esther’s Place, the JMM Shop. We Were the Lucky Ones is Georgia Hunter’s first novel. It spent over four months on the New York Times Bestseller List, has been selected as a top pick by Harper’s Bazaar, the New York Post, People Magazine, and Audible, among others, and has recently been optioned for Television as a Limited Series. Hunter’s website, georgiahunterauthor.com, offers a behind-the-scenes glimpse at the extensive research this project has entailed. She lives in Connecticut with her husband and their two sons. This program is presented in partnership with the Enoch Pratt Free Library as part of their Writes LIVE series.